Impressive wall map of India. This is a staggering wall size map of India and Ceylon originally issued in 1768 by Thomas Jeffreys. Covers the Indian subcontinent from Mekran in the west to Assam and Aracan in the east, and from Bhutan in the north, south to Ceylon and the Maldives. Offers extraordinary detail throughout, with numerous notations on matters geographical, historical, and cultural. Shows roads, caravan routes, oases, temples, cities, treaty lines, archeological sites, mountain ranges, lakes, swamps and rivers. 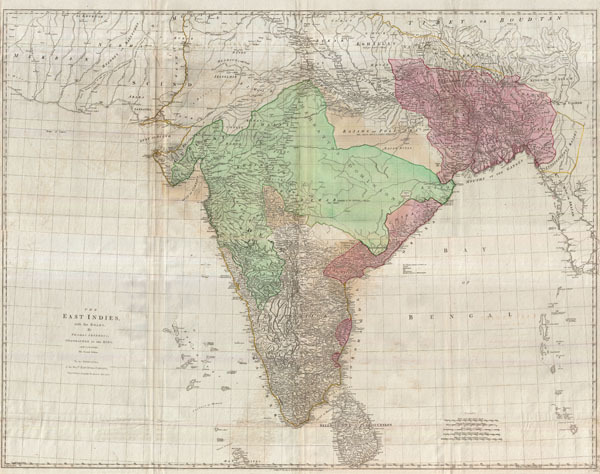 This map offers a smorgasbord of information for the historian interested political changes in India during the 18th century. Identifies Delhi (or Shah Jehan Abad), Agra, Bombay, Goa, Calcutta, Pondicherry, and countless other major and minor cities. All in all a spectacular map with much to offer and a welcome addition to any serious collection focusing on the subcontinent. This map was prepared by Jefferys and originally published by Sayer and Bennet. This is the second edition, and was published by Laurie and Whittle in Kitchin's 1794 General Atlas. Kitchin, Thomas, Kitchin's General Atlas, describing the Whole Universe: being a complete collection of the most approved maps extant; corrected with the greatest care, and augmented from the last edition of D'Anville and Robert with many improvements by other eminent geographers, engraved on Sixty-Two plates, comprising Thirty Seven maps., Laurie & Whittle, London, 1794. Very good condition. Four sheets joined. Professionally flattened.